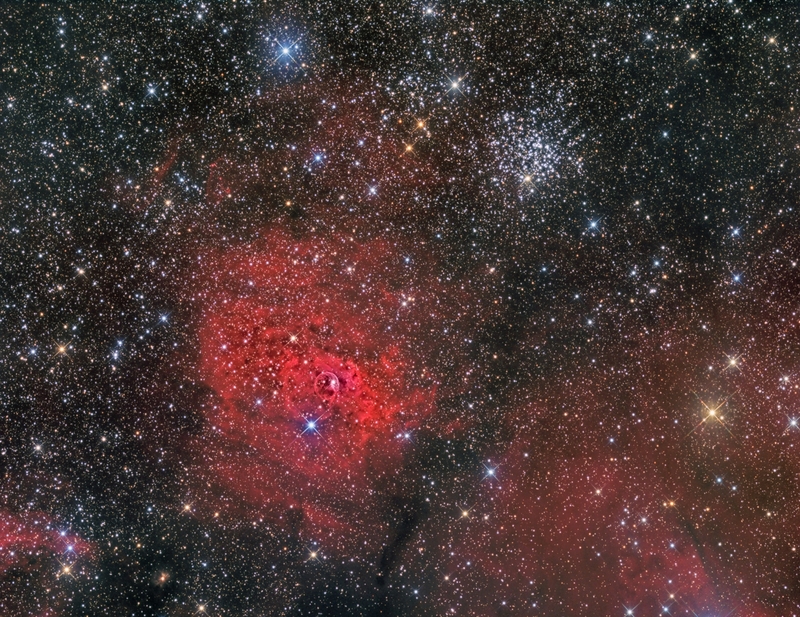 The Bubble Nebula (NGC7635) is the most famous object in this image, just left of centre. 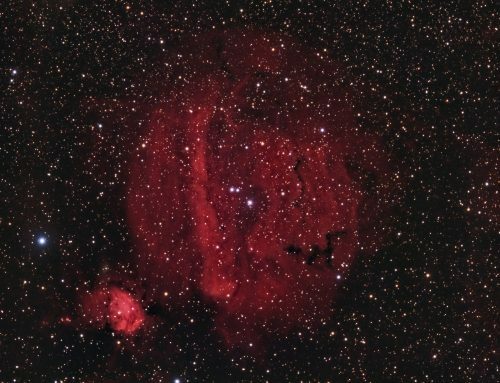 The bubble is surrounded by Sh2-162, a billowy, textured cloud of glowing hydrogen gas. Both are between 7,000-11,000 light years away. 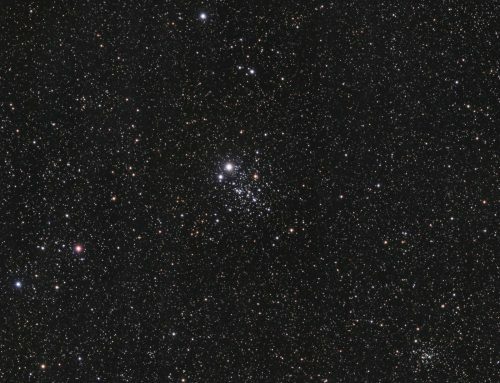 The open cluster M52 sparkles at upper right, and is located 5,000 light years away. 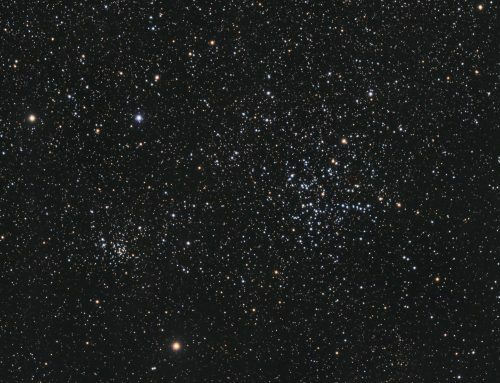 It is one of my favourite small telescope open clusters. 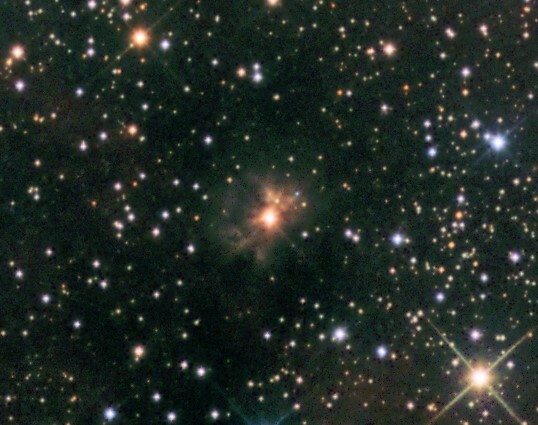 Part of the large, faint, Sh2-161 is at lower right, also around 9,100 light years from us. 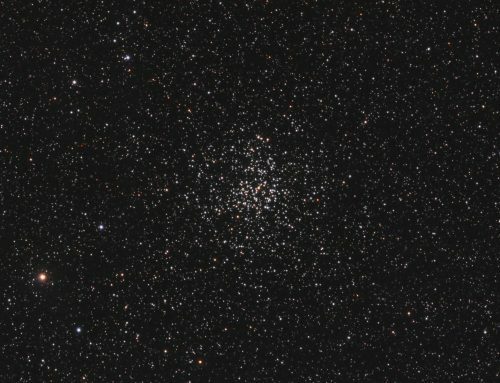 Cz43 (Czernik 43) is an inconspicuous open cluster that I probably wouldn’t have noticed had it not been referenced in one of my star atlases. You can find it halfway from M52 to the brightest star to its upper left. Herbig-Haro 170 (also known as MWC1080) is the small orangish patch of nebula surrounding a very young star to the lower left of the Bubble. Herbig-Haro objects are associated with newly born stars, and form when gas ejected by the stars collides at high speed with surrounding clouds of gas and dust. Moravian G3-16200 EC camera (on loan from O’Telescope), Optolong Ha, O3 and RGB filters, 10″ f/3.6 ASA astrograph, Paramount MX, QHY5 guide camera through Lumicon 500 mm f.l. achromat. Acquisition with the SkyX, Focusing with FocusMax. All pre-processing and processing in PixInsight. Acquired from my SkyShed in Guelph. Nearly full moon for Ha and O3; no moon for RGB, no cloud, good transparency and average seeing throughout. 20x10m R, G and B; 21x20m Ha and 12x20m O3 unbinned frames (total=21hr). Creation and cleanup: R, G, B, Ha and O3 masters were cropped and processed separately with DBE. R, G and B were combined to make an RGB image which was processed with ColorCalibration. The NBRGBCombination script was run with default settings using Ha for red narrowband. RGBWorkingSpace was used to equalize the channel weights and the luminance was extracted for later processing as SynthL. The O3 image was stretched with HistogramTransformation for later use as a mask. 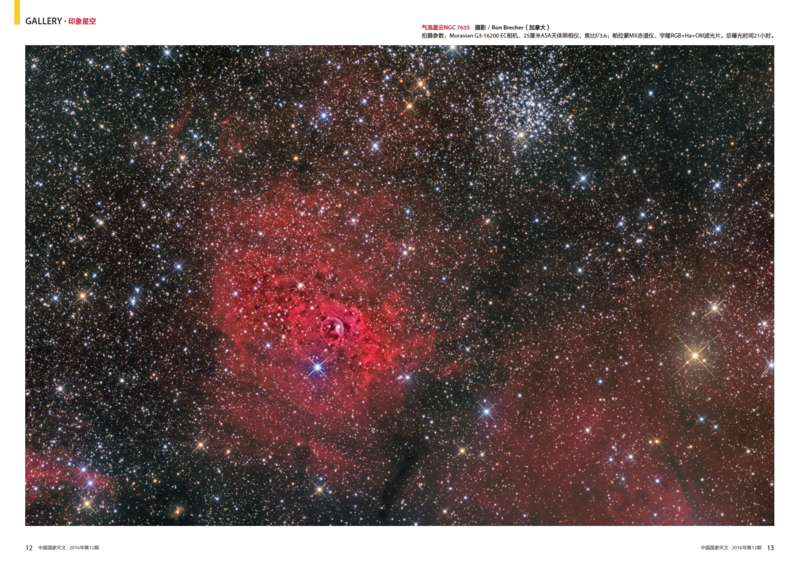 Dynamic Range Compression: HDRMultiscaleTransform was applied at 6 and 4 pixel scales using a mask to protect the stars. Contrast Restoration: The contrast decrease caused by HDRMultiscaleTransform was restored with two passes of LocalHistogramEqualization (scale 54, strength 1.00; scale 150, strength 0.6). Final Steps: PixelMath was used to subtract a star mask from the stretched O3 image. The result was used as a mask to boost blue and green in the strong O3 regions of the Bubble Nebula (mostly along the upper right edge). MorphologicalTransformation was used to reduce the prominence of the stars. 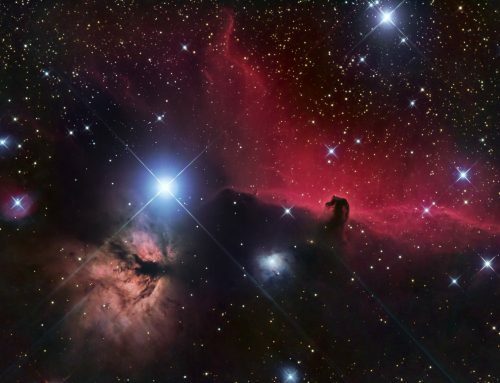 Background, nebula and star brightness, contrast and saturation were adjusted in several iterations using Curves with masks as required. SCNR was applied at 70%. Image scale is 1.36 arcsec per pixel for this camera / telescope combination. Beautiful image. Can’t believe what went into producing it.